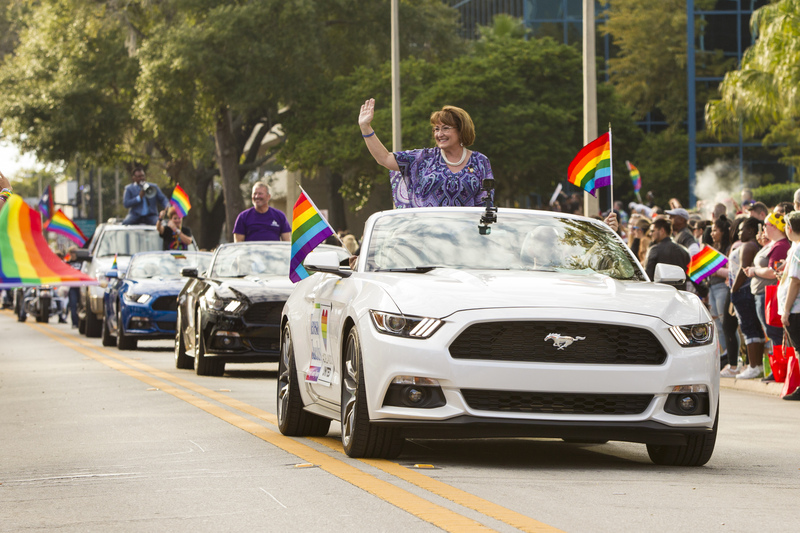 Orange County Mayor Teresa Jacobs joined City of Orlando Mayor Buddy Dyer as a Grand Marshal for the 2016 Orlando Come Out with Pride Festival and Parade, which celebrated the LGBTQ community and all those that stand united with Orlando. City of Orlando District 4 Commissioner Patty Sheehan, Orange County Sherriff Jerry L. Demings and City of Orlando Police Chief John Mina were also participants in the parade, which gathered more than 50,000 attendees. The parade was held Nov. 12, five months after the Pulse nightclub tragedy, when 49 lives were lost and 57 individuals were left injured. At the end of the parade, participants gathered for a Pride Rally at the Walt Disney Amphitheater at Lake Eola Park, where Mayor Jacobs presented a proclamation declaring Nov. 12 Come Out with Pride Orlando Day in Orange County. “Through events like Come Out with Pride, we continue to celebrate our community’s rich and colorful diversity, as well as break down the walls of fear, prejudice and discrimination by sharing a message of understanding, compassion and support,” Mayor Jacobs said. Mayor Jacobs thanked the LGBTQ champions, advocates and leaders throughout Central Florida for their collaboration and support during Orlando’s most difficult moment in history. Come Out with Pride, Inc. is a nonprofit organization made up of an all-volunteer board and production team inspired to make an impact in the LGBTQ+ community. The Metropolitan Business Association, Central Florida’s LGBTQ Chamber of Commerce, saw the need for the Pride festival to focus on building unity and cohesiveness within the community, which led to the creation of Come Out with Pride in 2005. The Come Out with Pride Festival and Parade features a week of celebratory events with the Pride Parade and Rally as the main event. This year, the festival honored those who were lost and injured on the June 12 tragedy and also recognized the first responders, elected officials, community leaders, citizens and families who played a vital role in the wake of the tragedy. Earlier in the day, Mayor Jacobs and Commissioner Sheehan joined the LGBTQ Pride and Allies of Orange County and citizens at the display of the 49 Pulse tribute crosses at Orange County’s Regional History Center. The 49 Pulse tribute crosses placed alongside Lake Beauty on the Orlando Health campus were transferred to Orange County’s Regional History Center on July 12, one month after the Pulse nightclub tragedy. The crosses were designed and built by artist Greg Zanis, who traveled 1,200 miles from his home in Illinois the week following the Pulse nightclub shooting to place the crosses just outside Orlando Regional Medical Center. The crosses were later transferred to the Orange County Regional History Center where they could be preserved as part of the One Orlando Collection Initiative. Each cross features the name of a victim and a red wooden heart. The crosses are covered with heartfelt messages from those who paid tribute to the victims. To view photos from the 2016 Orlando Come Out with Pride Parade and Rally, as well as the Pulse cross tribute display, visit Mayor Jacobs’ Flickr album.